The two countries also give priority to cooperation on oil and gas exploration in Yamal, a Russia to India gas pipeline and the Delhi Mumbai Industrial Corridor project. Having failed to achieve a breakthrough in the negotiations to clinch a final deal on the construction of Units 3 and 4 of the Kudankulam Nuclear Power Plant (KNPP), the 19th meeting of Indo-Russian Inter-Governmental Commission on Trade, Economic, Scientific, Technological and Cultural Cooperation (IRIGC-TEC) decided to go for joint investment in at least a dozen of major projects with an aim of boosting bilateral trade turnover between the two countries. The most promising of these projects appears to be the joint production of two types of commercial aircraft in India. The joint project on the Russian production of commercial aircraft includes both the Sukhoi Superjet-100, now being built in Russia, and the futuristic aircraft Irkut MS-21, production of which will start soon. Speaking to journalists, Yevgeny Popov, the head of Asia and Africa Department of Russian Economic Development Ministry said quoting Indian experts that manufacturing of the Russian passenger jets in India would cut down the production costs by 40 percent per plane. The president of Russia’s United Aircraft Corporation, Mikhail Polgosyan said recently that in the period up to 2016, India will experience double-digit passenger growth. “Owing to solid economic growth and substantial investments into the airport infrastructure, India will maintain the substantial traffic growth rate,” he said. Pogosyan said that Russia is planning to expand the borders of its presence in India by marketing products from the passenger airliners. “In the segment of 90-120 seats, Russia is planning to win 25 percent of the market with SSJ-100, and in the segment of 140-220 seats, it hopes a 14 percent of the market of MC-21,” he said. “India is a good potential opportunity for us. As in India the aerospace services market is fast growing, we are ready to collaborate with India in the segment of customer support services as well,” he stressed. “We have good experience in military segment and now we see the vast opportunity to expand our cooperation to transport and commercial segments as well. We are ready to involve rapidly growing local business into our joint programmes. India is a market that no one, who wants to be successful in the aerospace segment, can afford to ignore,” Pogosyan said. 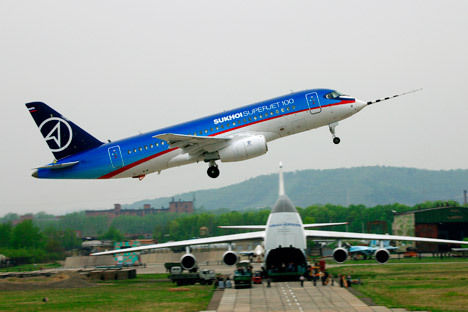 The SSJ-100 is a medium-haul passenger aircraft capable of carrying 75-95 passengers, developed by the Sukhoi Corporation in cooperation with US and European aerospace companies. The MS-21 is a family of twin-engine jet airliners still under development by the Irkut and the Yakovlev design bureau, part of Russia's United Aircraft Corporation. It has a capacity of 150-212 passengers. The cutting-edge technologies, being the core ingredient of the SSJ-100 Project, penetrate its every stage – from design and development to final assembly, delivering a modern, economically efficient and globally marketable aircraft. The then Russian President Dmitry Medvedev first offered India joint production of five types of passenger aircraft including regional SSJ-100 airliners, in December 2011, saying the two countries could benefit in this from the accumulated experience in the development and production of combat jets. India has a long history of building Russian aircraft under licence at the HAL, but has so far only assembled military aircraft. Bilateral cooperation in the field of civil aviation before has been realized only through the creation of local enterprises for repair and maintenance. Under the deal on investment in the priority joint ventures, another project concerns with the construction of a Russia to India gas pipeline which will run across the Central Asian Countries, Afghanistan and Pakistan. During the IRIGC meeting, the sides agreed to create a Joint Study Group (JSG) to build this pipeline. The new pipeline would not necessarily be a part of the planned TAPI (Turkmenistan-Afghanistan-Pakistan-India) project, although it might run parallel to it, an Indian official told this writer on the condition of anonymity at the sidelines of the joint press conference of Khurshid and Rogozin at the Hotel President, last Friday. The two sides also finalized a programme of cooperation in the field of oil and gas on the Yamal Peninsula in northwest Siberia. The official said that at the IRIGC meeting, the Russian side, for the first time, evinced a “serious interest” in the $90 billion Delhi-Mumbai Industrial Corridor (DMIP) - a mega infrastructure project under the Indian government. The project covers an ambitious, long zone of advanced infrastructure and investment between Delhi and Mumbai. India also pushed for negotiations to be started with the Customs Union of Belarus, Kazakhstan, and Russia over a bilateral free trade agreement (FTA). “Now the sides are engaged in working out a formula, including the language and legality aspects, to reconcile the Indian Civil Nuclear Liability Law. The formula would essentially waive the liability clause for Units 3 and 4, but it must not set a precedent for the US and France to seek similar exceptions,” the official said. The IRIGC-TEC meeting on October 3-4 was co-chaired by External Affairs Minister Salman Khurshid and his Russian counterpart Deputy Prime Minister Dmitry Rogozin.